Mineral wool is made by melting down basalt stone and recycled slag from steel mills before spinning it into fiber. It can then be formed into batts or boards. 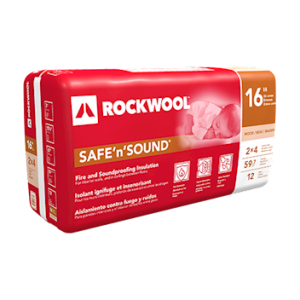 SAFE‘n’SOUND® soundproof insulation is a stone wool insulation product for use in interior wall partitions of residential wood and steel stud construction. It is especially useful when superior fire resistance and acoustical performance are required. This non-combustible, lightweight product has excellent acoustical dampening properties and is dimensionally stable, making it ideal for friction fit in wall, ceiling and floor applications. This product is also chemically inert and therefore will not promote corrosion. COMFORTBATT® is a stone wool insulation product for use in wood and steel framing in both new residential and commercial builds and renovations. This semi-rigid batt designed for thermal resistance in wood and steel framing, has a unique flexible edge designed to compress as the batt is inserted into walls, attics, ceilings and floor frames. The flexible edge springs back, expanding the batt against the frame studs to provide a complete fill. 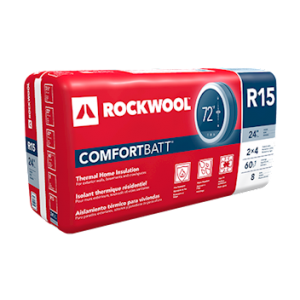 ROCKWOOL COMFORTBATT® compensates for normal variations in stud centres caused by distortion or warping. The special flexible characteristic at the edge of the insulation ensures that the expected R-value is achieved. 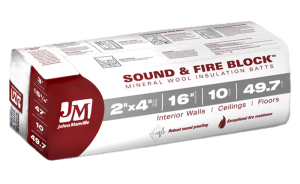 Johns Manville Sound & Fire Block® mineral wool batts are non-combustible and moisture-resistant. The high-density fibers in mineral wool help delay the spread of fire and reduce noise transfer in interior walls and between ceilings and floors.